If you’re watching a national televised event such as the Superbowl or the Academy Awards, attending a sold-out concert in New York City, or catching up on the latest cultural news, chances are, Alexandra Covington is too—and she’s also tweeting about it, making causal quips through the eyes of a snarky-meets-sweet twenty-something who is planting her roots as a viable voice in new media. Covington, whose carefully curated wardrobe is a collection of bohemian, bold, and classic designs, takes a high-low approach to beauty. 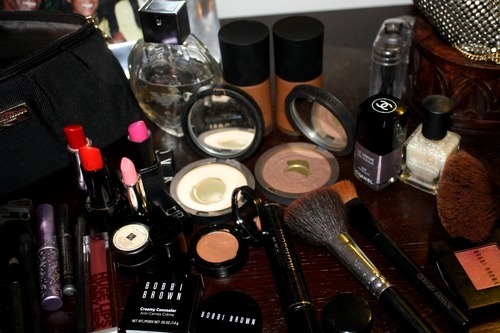 Drugstore staples fill her bathroom cabinets, while designer powders and palettes brim her cosmetics case. Covington follows a basic skincare regimen to maintain smooth skin. Twice daily, she uses Neutrogena Acne Therapy System. The three-part kit includes a pore refining salicylic acid cleanser, a moisturizer with blemish fighter benzoyl peroxide, and an SPF 15 lotion. On days when her skin requires more pampering, Covington prefers Aveeno Ultra Calming Foaming Cleanser. Leaping from Walgreens to runways, she uses the lightweight and luxurious Armani Luminous Silk Foundation for her base, followed by Armani Luminous Silk Powder in both deep and illuminating shades to contour her face and highlight cheekbones. Bobbi Brown’s Shimmer Blush is applied to the apples of her cheeks for just the right amount of flush. Covington prefers understated eyes, so a few dabs of Creamy Concealer from Bobbi Brown around her eyes, and a swipe or two of Diorshow in Blackout is all she needs. And to finish? 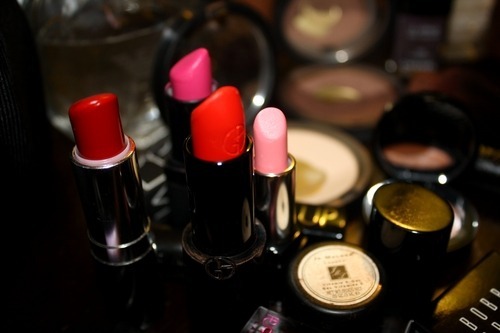 Her technicolor lipstick arsenal helps cap her signature look. Covington’s favorites are Rouge D’Armani Sheer Lipstick in 302 and NARS Semi Matte Lipstick in Schiap.